Ryan, Cornelius. 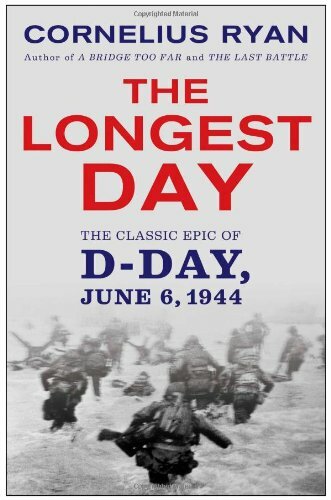 The Longest Day: The Classic Epic of D-Day. New York: Simon & Schuster. Reprint, 1994. B/W photos, index, bibliography. 350 pages/277 pages of text. ISBN 9780671890919, $17. An instant classic when originally published in 1959, The Longest Day continues to stand the test of time. As a first time reader I can fully understand the praise and longevity this volume has achieved. Cornelius Ryan was born in 1920 in Dublin, Ireland. While he didn’t experience the fighting first hand he did experience the war from close quarters. During the war he served as a correspondent and flew in bombing missions with the U.S. Air Force and also covered the D-Day landings. This first hand knowledge of events no doubt served him well in the years it took to research and write this account. Ryan went directly to the sources for much of his research. He used war documents from many countries, used diaries from Generals and other military figures, and interviewed literally hundreds of participants, both soldiers and civilians. Here, we read the story of the great beach landing that ultimately led to the end of the Third Reich. The book is divided into three sections. The Wait describes the buildup and planning needed until the decision by Dwight Eisenhower to launch the invasion. The Night covers the glider and paratrooper assault and the goals of each. The sea of confusion that comes into play when targets are missed is conveyed to the reader in such a way as to show the fear these men must have felt. The Day describes the beach assault and the horrors, and death, the soldiers faced. Throughout, one sees over and over again how the German high command failed to heed what in hindsight are obvious signals and warnings about the attack. Air power was moved from the coast, Rommel was headed to meet with the Fuhrer, lower level generals seemed clueless and all along, nobody believed the assault to be the real deal. From Hitler down, or perhaps because of Hitler’s belief, it was assumed this was just a jab and the attempted knockout blow would be delivered elsewhere. Even once the full assault was underway few were willing to adjust their beliefs let alone stand up to Hitler. In fact, the Fuhrer was not even awakened to inform him of what was happening. Had the Germans been more aware the outcome of June 6, 1944 could have been different. This is not a “what if” book however and the Germans, with no air support and little leadership, were caught off guard. The actions of the following days, weeks, and months are not told here. This book deals only with June 6. We ultimately know the result however. While an easily readable book there is a major failing here and I do not know if it through Mr. Ryan or the publisher. The book is sorely in need of maps; the version of the text I read contained none. When I say maps, I mean it needs many. French geography is not my strongpoint and so I was lost in terms of where things were happening. Despite my concern about maps I can highly recommend this title for anybody interested in the western theatre of World War II. From the novice, such as myself, to the reader who has read more deeply about the war, there is something to be learned here. Clark, Jerry and Ed Palattella. A History of Heists: Bank Robbery in America. Lanham: Rowman & Littlefield, 2015. B/W photos, end notes, bibliography. ISBN 9781442235458, $36. There is a certain kind of allure and romance that surrounds the bank robbers of yesterday. Just look at the mountains of paper that have been spent publishing about the likes of Butch Cassidy, John Dillinger, Jesse James, and others. More recently, Patty Hearst and the Symbionese Liberation Army, the “Pizza Bomber” and others have garnered headlines. While the age of the bank robber hero is gone, the fascination with these individuals is still there. Hollywood has scratched this itch with numerous films, many of which have proven to be huge blockbusters. 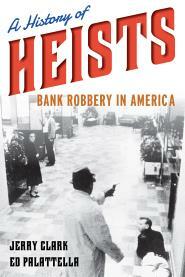 Authors Jeffrey Clark and Ed Palattella are well positioned to have written a book titled A History of Heists. Clark is retired from the Federal Bureau of Investigation where he spent twenty-seven years. He is now a professor of criminal justice at Gannon University. Palattella writes for the Erie-Times News and is known for his writing on crime. This is their second book together, having earlier published Pizza Bomber: The Untold Story of America’s Most Shocking Bank Robbery (Berkley True Crime). Despite the alleged glamour and high life that bank robbers are often accorded and the view that bank robbery is still common Clark and Palatella explode those myths early on. In 2013 only two out of every 100 robberies involved a bank with the culprit being caught more than 60% of the time. In addition, bank robbery is not overly profitable with the average take being less than $4,000. The lives of the most famous of the early bank robbers such as Butch Cassidy and the Sundance Kidd, Jesse James, John Dillinger and others are exposed as less than glamorous as they attempted to stay a step ahead of law enforcement. What Clark and Palattella have done quite effectively is bring the historical characters to life. From Jesse James and his need for publicity to Butch Cassidy and his creation of the professional thief to the lesser known Henry James who they call the last of the horseback outlaws these men, and occasionally ladies, are given their due. While these people are criminals, often violent ones, we come to see them as humans as well. That is not to say these are sympathetic portrayals. In fact, it comes through that these individuals were armed, dangerous, and despite how they preferred to be thought of, or how the news of the day portrayed them, they were criminals. While most will want to read this book for the stories of those who have been glamorized on-screen, modern bank crime receives it’s due as well. With the spread of the suburbs in the 1960’s came a rise in bank branches and thus a rise in bank robberies. The Bank Protection Act of 1968 attempted to insure that banks were taking adequate security measures. Despite these mandates banks remained behind criminals in terms of technology. While that has changed in regards to physical banks over time, protecting assets online is still a struggle for the industry and criminals can now steal more money, with less chance of being caught. In fact the authors propose that if Bonnie and Clyde were alive today they would be stealing via keystrokes rather than with guns. While certainly not a definitive look at bank robberies or the most notorious robbers this is a book that succinctly covers the subject. It is an easy read and recommended for those with a passing interest as well as those with more knowledge on the subject. Complete with b/w photos, notes, and a bibliography this is a book sure to engage any true crime reader. Recommended. Here are a few events that you might consider attending over the next few weeks. In some fashion they are all historically themed. OK you have to stretch on a couple but you get the picture. If you have an event upcoming you would like me to share drop me a line with all the relevant information. Just see my “contact” page for the details. Back in the Day Lecture Series Speaker Mike Bennett will discuss the wreck of the Vera Cruz. Ormond Beach Historical Society, $2 for non-members, free for members. Saturday, October 17 9:30am. Florida Harmonica Championships The 10th annual championships will be held on Sunday, October 18. A workshop will be held at noon and the championship starts at 1pm. The event will be held at the Beachside Tavern. A History of Glencoe, FL and Captain Charles Coe Hosted by the New Smyrna Museum of History. November 5 at 1:30. Coe descendant Andrew Foster will be sharing family history and artifacts. Click here for more information. The event is free; donations are appreciated. Mr. Foster has a website that is worth checking as well. New Smyrna Beach Antique and Vintage Market November 7 on Canal Street in downtown NSB. The event is from 9am-5p. Halifax Art Festival , the second oldest, continuous art festival in the state of Florida, will be held on November 7 & 8 in downtown Daytona Beach. The festival will be located on Beach Street between Orange Avenue and Bay Street. More than 200 artisans will be in attendance. The 2015 issue of El Escribano, complete with a 2013 date, issued by the St. Augustine Historical Society has arrived. If you aren’t a member, I highly recommend joining. If you are a member your copy should be arriving soon if it hasn’t already. For those wondering, a loose translation of escribano is “scribe” or “notary”. In early St. Augustine the escribano was one of the few who could write and so in their honor the journal was named. Roberts, Larry. 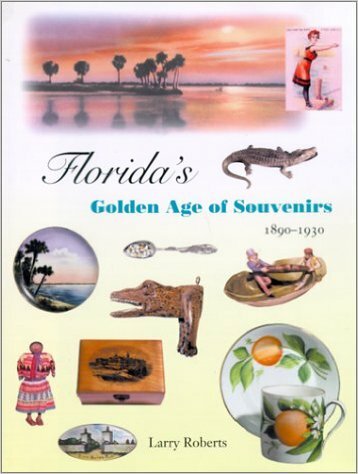 Florida’s Golden Age of Souvenirs, 1890-1930. Gainesville: University Press of Florida. 2001. 217 pages, index, bibliography, color photos. ISBN: 9780813024240, $39.95. Twenty-first century tourists who come to Florida are bombarded with thousands of options for souvenirs to take back to their home town. These modern trinkets, often of a disposable nature, are not the focus of this large, hardcover, beautifully illustrated volume. Instead, what we get here are items of a higher quality that while decorative, are often functional as well. The late 1800’s and early 1900’s were a period of tremendous growth for the state of Florida. From a population of under 395,000 in 1890 the state was home to just under 1,500,000 residents in 1930. Along with the increase in population came an increase in tourists; many being winter visitors who spent several months in the balmy Florida climate rather than face the ice and snow of their home state. These part-time residents would often want reminders of their time in Florida. Author Larry Roberts has put together a wonderful pictorial book showcasing the variety of souvenirs available to visitors during the early twentieth century. Starting with a historical sketch of Florida tourism the book then is broken down by type of souvenir. Included are china, spoons, carved alligators, Harris and Barnhill prints, orangewood and mauchline ware, Seminole dolls, glass, jewelry, Olive Commons jewelry and porcelain, Silver Springs pottery and metal and shieldware. Each chapter starts with a small amount of text, providing readers an introduction to the subject. The photos for each chapter are set up after the conclusion of the introduction. This text will often make reference to one or more of the photos forcing readers to flip pages in order to view what is being discussed. The photos are of high quality, with excellent color, but only have brief descriptors. Also, items only receive one view so if there are details on multiple sides of an item we don’t get to see them. This becomes particularly problematic for some items such as the Silver Springs pottery created by Henry Graack. In the text we learn about the makers mark he used on the bottom of his works but we never see an example. The signature that Olive Commons hid in her works is discussed but again we never get to see an example. While interesting and good to know, novice collectors might like to see her mark thus giving them knowledge and confidence should they potentially find a piece of her work. Overall, I enjoyed this book. The text was easy to read and the photos beautiful to look at. For those looking for a price guide or in-depth collecting reference you should look elsewhere. If you are interested in learning a bit about early Florida tourism and seeing what visitors would have taken home with them, this is a book worth looking for. This is by no means an inexpensive book but it is a large size, hardcover, printed on high quality paper and these type books are never cheap. Here are a few books I have added to my library recently that you might consider taking a look at. Founding Brothers: The Revolutionary Generation written by Joseph J. Ellis. Discusses how our founding fathers; Washington, Adams, Jefferson, Burr, Hamilton, Franklin, and Madison came together to create the workings of our Federal government. American Sphinx: The Character of Thomas Jefferson written by Joseph J. Ellis. Ellis follows Jefferson from the drafting of the Declaration of Independence through his retirement at Monticello. For this work Ellis was a National Book Award winner. 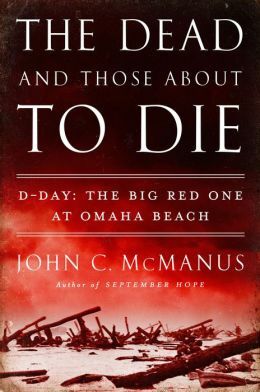 The Dead and Those About to Die: D-Day: The Big Red One at Omaha Beach written by John C. McManus. This is an examination of the 1st Infantry Division (nicknamed The Big Red One) during D-Day. A Wilderness So Immense: The Louisiana Purchase and the Destiny of America written by Jon Kukla. From the brink of war to the shaping of the newly expanded country Kukla discusses it.